Two weeks left of my maternity leave and I’m trying to simultaneously soak in every last moment of being a full-time mommy to my perfect little man, as I dread every minute that brings me closer to heading back to the office. I still can’t really write about it because I’m still trying to pretend it’s not happening, so yeah. Today we took T to get his blood drawn in advance of his GI appointment on Wednesday. I’m hoping this will be his last blood draw for the foreseeable future because he is becoming more and more aware and I swear that when they put the tourniquet on him today he knew immediately that whatever was coming next was Not Good because he commenced his freak out toute suite. There were so many tears that they were dripping into his ears and there was a wet spot on the paper sheet he was laying on. The (two) phlebotomists were treated to Super Sad Pouty Face. They were awesome though and managed to get two vials quickly with only one prick. Much better than the last time we went to this lab and had to go through two heel sticks because the first sample clotted. 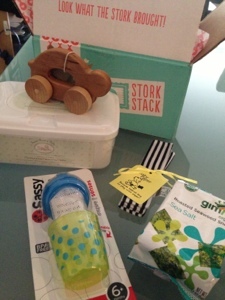 And, also awesome, I got to tear into this month’s Stork Stack right when we got home! I was waffling on whether or not to order this month but ultimately decided to go for it and was glad I did! 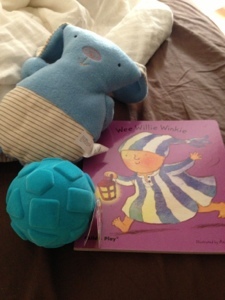 We have been loving the Wee Willie Winkie book (which Paul reads to T every night along with Good Night Moon) and his North American Bear Co. puppy, both of which I never would have found without last month’s box. My one complaint with last month was that a couple of the items (the reuseable bag and the ball) didn’t feel age appropriate, but everything this month is absolutely right for his age range! Sassy Baby Teething Feeder ($7): This was the first thing I pulled out of the box and it felt so perfect because T will be six months next month and Paul and I just started talking about trying out baby led weaning when the time comes! I’ll be honest, I don’t quite get how this thing works yet but it says it’s a safe way to give a baby whole foods while reducing the risk of choking so sounds like in about a month it’ll be right up our BWL alley! Tree Hopper Toys Animal Jalopies ($15.99): We received Shelly the turtle. My cousin who is a pediatric PT loves wooden toys so I know this will get her stamp of approval as this is handcrafted from sustainable American hardwood (according to the Stork Stack packing sheet). I rolled it around on the table for a bit and T seemed to enjoy watching it, I’m sure he’ll like it even more when he has the hand eye coordination (and ability to sit up) to do it on his own. Baby Paper ($6): This was another timely item because just yesterday T attempted to eat some tissue. This is like a cross between cloth and paper and it’s crinkly! I can’t wait to wash this so T can go nuts on it. Susan Brown’s Baby Moisturizing Cleansing Cloths ($13.99): These seemed ridiculously overpriced for what I’m assuming are essentially baby wipes? I did find that Toys’R’Us sells them for $8.99 but that still seems steep. But that’s the cool thing about these boxes right? Trying things you’d probably never splurge on if you had to pay full price. I’m interested in seeing just how much more amazing these are compared to regular baby wipes. I’ll probably use them a lot more judiciuosly than the Huggies ones which I use pretty indiscriminately. Most likely these will be used to wipe down T before bed on his non-bath days. GimMe Health Foods Roasted Seaweed Sheets ($1.19): Being asian, I’ve loved seaweed sheets for about as long as I can remember. When I was little my mom used to buy the boxes at the Chinese market and I would tear through them in one sitting. Paul is the same way. Needless to say we went through this in about 15 seconds flat. It was delicious but nothing special as far as seaweed sheets go, although I think that was the first USDA certified seaweed I’ve ever had. Overall I really liked this months box! I’m excited to put everything to use and I think I got more than my money’s worth! If you’re interested, please use my referral link to get $10 off your first box! I got a notification early this morning that my Love With Food box had shipped so I was surprised when I checked the status later in the morning and saw that it was out for delivery! Great Full Cookie from The Cookie Department, Inc.: Paul saw that it was a vegan cookie and immediately declared he wanted no part of this cookie. Strawberry Preserves from Bonne Maman: Planning to use this on my next pbj sandwich. Hand Drip Coffee from Caffe Borsa: I’m not much a coffee drinker but Paul should enjoy this if it’s any good. Original Cajun Seasoning from “Slap Ya Mama”: Paul said he’s been meaning to try this so this works out perfectly! Tomato Crunch from Snapz Crisps: This seemed a bit out of place in a breakfast box but could be interesting. Authentic Almond Biscotti from Biscotti Bari: Unlike the vegan cookie, Paul claimed dibs on this right off the bat. Latte Candy from Bali’s Best: Nothin’ bad about coffee flavored candy in my mind. Mystery Item: Coconut Almond Crunch by Mrs. May’s Naturals: This is the only thing we’ve tried so far, Paul ate it as part of his dinner and even deigned to let me have one. We’ve bought the regular almond crunch flavor before from TJ’s so there was no real surprise here but it was tasty. I was really looking forward to this box because I love trying new food/snacks and I don’t know if I just got myself too hyped up but I found myself a little disappointed by this box. Don’t get me wrong, everything in it will likely be eaten and enjoyed well enough, but I was really hoping for at least one item to love and I don’t see that happening (although maybe the latte candy? or the seasoning?). That said, I got this box for $2 with a coupon code so I can’t really complain. Normally the box is $10+2 shipping so I think I’ll give it another chance since that still only comes out to $7/month (yes I’m a nerd and am thinking of it in terms of the dollar cost average). If you’re interested in trying out the box (because I did such a great job of selling it, right? lol can you believe I do this for a living? ), please use my referral code! Nothing new, but I’ve been having a bit of writer’s block lately. Actually more like finishing-a-post block, but the result has been the same -> no posts. So I thought I’d get myself back in the groove with something easy like a review! A couple weeks ago I finally discovered the subscription box craze and went a little nuts. I found a bunch of coupon codes and decided to try every box that looked interesting that I could get a code for. 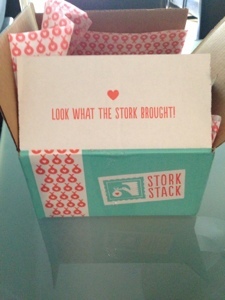 Ever since then I’ve been waiting anxiously for the boxes to start arriving and I finally got the first one today – Stork Stack! Extra points for arriving early in the month! I’ll be honest, I peaked at a bunch of reviews before it came so I already knew the possibilities for what could be in the box (I think it ships from the midwest so I got mine fairly late versus people who live closer to the point of origin). North American Bear Co. Two-Dees Animals ($16): I thought it was a bunny but it’s actually a puppy. It’s super soft even if I don’t personally think it’s cute in the traditional sense. It’s weird though because it kind of grows on me every time I look at it. I gave it to T while he was hungry and he kept trying to eat it so I’m thinking I should throw it in the wash before I let him at it. Rubbabu Educational Ball ($6.95): I feel pretty ambivalent about this. Maybe T will enjoy it when he’s older but right now it’s too big and heavy for him to hold. Not sure why this was in a box for a four month old. Child’s Play Wee Willie Winkie board book ($4.99): Great book for a newborn, I’m always amazed that such a little baby actually seems to enjoy being read to. He really seemed to like looking at the pictures. It’s not a book I would have thought to buy on my own but I’m glad it was included in the box. 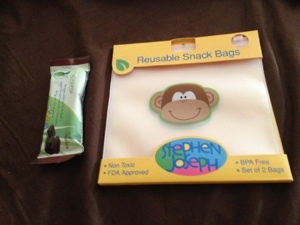 Stephen Joseph Reusable Snack Bags ($6.99): It comes in a two-pack and they’re top-rack safe, which is nice. Paul was wondering why we would use these instead of regular old ziploc’s and I tend to agree but since we have them I think we’ll use them and take a stab at being a little bit green when we can. Like the ball I don’t really think this fits in a newborn box, though. Credible Cravings Chocolate ($3.00): This is a chocolate bar geared towards women, before, during and after pregnancy (isn’t that every woman?). I was hoping for the Deep Steep Moisture Stick that other people mentioned but I guess I don’t really need more beauty-ish items for myself. I’m guessing this bar will probably be something I’ll like well enough but not purchase on its own. And at least it won’t be sitting around in my bathroom unused either. Overall, I think the box was a good deal considering I had a coupon code for $10 off, making it $17.99 for almost $40 worth of stuff. Compared to the reviews for other months I didn’t *love* the box but I’m thinking of giving it another month or two to see if they can really hit one of these months out of the park and get me hooked. If you sign up, use my referral code and we’ll each get $10 off! Update 5/9/13: I was wrong about the Credible Cravings bar, did not like it at all and ended up taking two bites and tossing it. But I’m seriously liking the North American Bear Co. puppy more and more, it really is perfect for a newborn because it’s so light it’s easy for him to hold and he keeps wanting to put it in his mouth.